If you checked out the post on Harissa, you’ll know that mine came out spicy enough that I decided to use it only sparingly, not piling it on everything like I imagined I wanted to. I still have dreams of harissa marinated lamb chops and chicken wings but I haven't permanently numbed my tongue enough to use mine as anything more than a background note for now. Hmm, I didn’t really use that much on my fries. How long does this stuff keep? I'd better use it up soon. But, preserved lemon. Am I really going to want to put that on everything? …let me try it on this black bean burger. 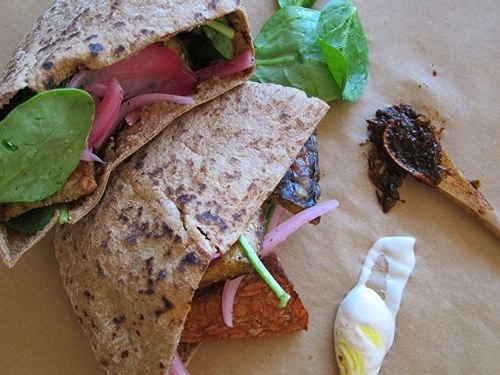 Moroccan sandwich! With lamb! Wait but it’s cashew cream, vegan, ok, what’s vegan? Tempeh! Morrocan spiced tempeh! Ooh on a pita with this and harissa! I’ll make harissa! That chain of thought is pretty much Exhibit A of why I felt the need to start a food blog. Heat the vinegar in a small saucepan on medium heat and stir in the sugar until dissolved. Pour over onions and set aside at least 30 min or until needed. Store in the refrigerator. Once you have all your components, the sandwiches are super easy and quick to assemble. Cut the tempeh into wedges and toss with a little olive oil and the spice mix. Then pan fry the tempeh wedges on both sides until golden. 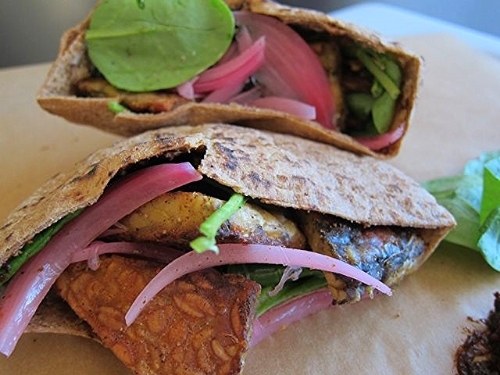 Stuff in a pita with baby spinach leaves, harissa, preserved lemon cashew cream, and pickled red onions. Enjoy while hot! If your harissa is as spicy as mine, add more cashew cream as you go, as needed. I made these vegan, but if you’re a committed carnivore I think these would be just as excellent with lamb or chicken. If cashew cream frightens you, preserved lemon blended with greek yogurt would be a good substitute.